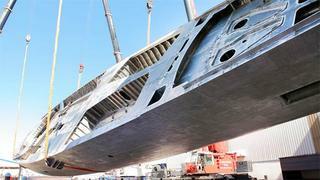 The aluminium hull of C.2193, the first of two yachts in the new generation of 60m sailing yachts sold by Perini Navi, was recently turned at their Istanbul-Yildiz shipyard. The 92 tonne hull stands out for being the heaviest turned to date at the group’s Turkish shipyard and the occasion of the turning offers an opportunity to admire the lines of a hull Designed by the yard’s naval architects in collaboration with Ron Holland. The aluminium hull and superstructure will result in a full load displacement of approximately 570 tonnes for a less than 500 gross tonnes vessel. The hull will soon be transferred to the Perini Navi Viareggio shipyard for outfitting and is scheduled to be completed for delivery in early summer 2013.